In college I subsisted on cafe lunches to power me through writing papers and studying for tests. Panera was a frequent stop of mine since they had salads and soups and SO much coffee. One of my go-to’s was their black bean soup and I’ve had it in the back of my mind to recreate it ever since. 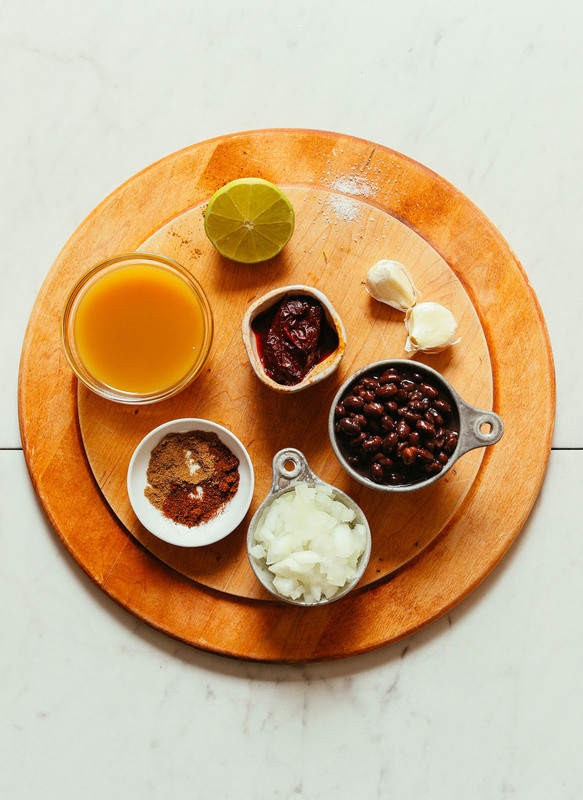 This recipe starts by sautéing onion and garlic until fragrant, then adding canned black beans, vegetable broth, and plenty of salt, pepper, and spices. The last-minute addition of dark chocolate totally made this soup! It provides depth of flavor, balances the heat, and ties all of the spices together. Swoon! This would make the perfect meal when you need something hearty and delicious on the table fast! It’s tasty on its own but also pairs well with cooked grains, tortilla chips, avocado, onion, and salsa! Into soup? Check out this 1-Pot Vegan Minestrone, 1-Pot Vegan Tortilla Soup, 1-Pot Golden Curry Lentil Soup, Fire-Roasted Tomato & Mung Bean Soup, and 1-Pot Everyday Lentil Soup! 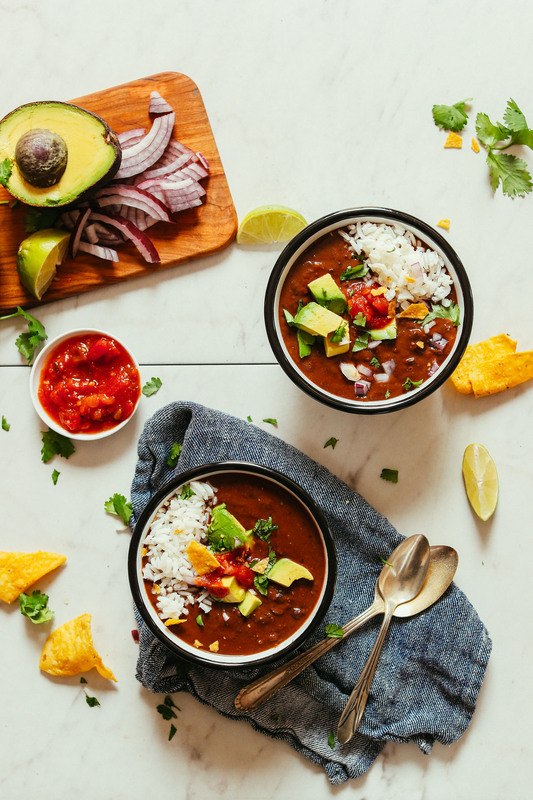 Easy-to-make, comforting black bean soup made with simple ingredients in 1 pot! A 30-minute meal or side that's customizable and incredibly satisfying. Heat a large pot over medium heat. Once hot, add oil (or water), onion, and garlic. Season with a pinch each salt and pepper and sauté for 4-5 minutes. 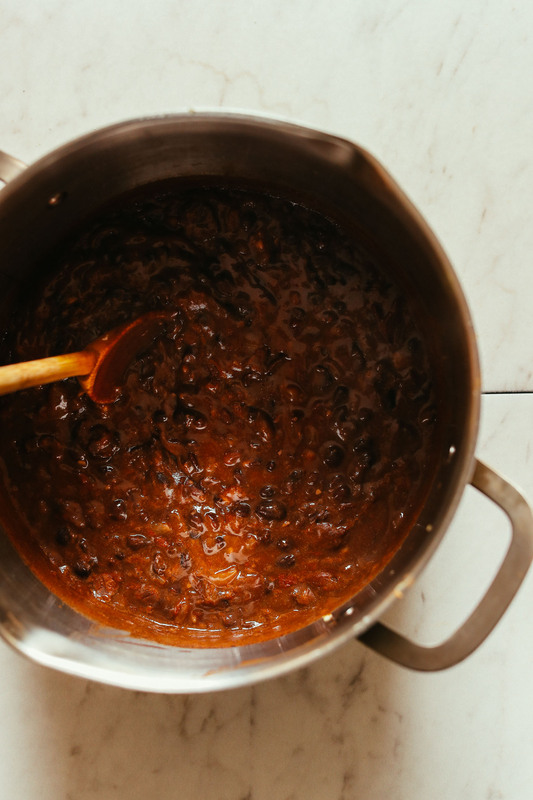 Add black beans, vegetable broth, cumin, chili powder, coriander, chipotle peppers (optional – start with the lesser amount and work up // adjust to preferred heat level), dark chocolate, and remaining salt and pepper (a couple healthy pinches each). Bring back to a simmer over medium heat, then reduce heat to low and cook uncovered for about 15-20 minutes (the longer it simmers, the more the flavors develop). Taste and adjust flavor as needed, adding chipotle peppers for spice, chocolate for depth of flavor, cumin or chili powder for smokiness, or more salt and pepper to taste. Enjoy as is, or pair with cooked grains such as rice or quinoa. Topping options include fresh lime, avocado or guacamole, cilantro, onion, hot sauce, and/or salsa! Store soup well covered in the refrigerator up to 5-7 days. Will keep in the freezer for 1 month (oftentimes longer). *Can sub canned beans with beans made from scratch. I don’t know which I loved more: the ease of making or the taste. Okay, the taste. Because with such full flavor I would have gladly spent twice the amount of time making it. I may not be Cuban or any other Latin American heritage, but I know a good black bean soup when I taste it. Healthy too! Thanks. Easy. Delicious! Have recommended to so many people. Need to triple the recipe… as it was gone too quickly. I couldn’t believe how delicious this was. And it was so easy! Delicious and so so quick and easy. I added a bit more broth, and using an immersion blender, I blended only some of it to make a creamy texture. Served with rice, Pico de Gallo, lime, and avocado. Absolutely delicious. Will you have your app soon? It will be amazing! Thanks for the interest, but we are not working on an app. This recipe was delicious! The recipe is almost entirely perfect as-is. Tip: if you add less veggie broth it’ll thicken up much faster. I used about 1/2 cup less. I also added a spoonful of nutritional yeast to help it thicken up, and this worked great! I’ve never had black bean soup before and didn’t know what to expect. As a busy mom, I didn’t know what to make for dinner last night and stumbled upon this recipe that I had all the ingredients for. What a pleasant surprise! I made the soup as per the recipe and omitted the chipotle peppers as I’m not a fan of super spicy and it turned out amazing! The soup has such a nice velvety texture and left me wanting more. I’ll definitely be making this again. Nice! I also added a can of diced tomatoes to the soup. Great idea to add cacao! This made for a hearty broth with a nice depth. Thanks for sharing! Lovely! thanks for sharing, Caroline! I love soups and black beans, but I cannot do broths or nutritional yeast or even tomato paste as I am very intolerant to free glutamate (i.e. “natural msg” – along with other things that can excite the nervous system). What spices/herbs would you suggest adding to water to make a substitute? Hmm, I’d say just up the other spices – cumin, lime, chili powder, paprika! And the chipotle pepper in adobo and the cocoa / cacao will really help. This. Is. Amazing. So flavourful, spicy, smoky, and EASY AS F*&$ to make. Thank you for introducing me to chipotle peppers in adobo sauce AND using chocolate!!! I made this tonight. It was such a simple recipe and quick recipe, but delicious! I made the recipe essentially as written (except for making 1.3 times the recipe as beans often come in 19 oz cans in Canada). I did add a little extra adobo sauce from the can of chipotles and added one chipotle, which was a nice amount (not too spicy) . We topped it with cilantro and avocado. Very hearty and satisfying. Thank you for the recipe! Hi Laura, thanks for your lovely review and for sharing your modifications! Great ideas! WOW, incredible! As in like, one of the best things I’ve ever eaten! Simmered longer and served with a dollop of brown rice, salsa and some avocado. Next time I’ll triple the recipe. Truly amazing. Lovely serving ideas! Thanks for sharing, Lola. Glad you enjoyed it! Made this for lunches – tastes so rich and delicious. I might have gone a *wee* bit heavy on the chipotle…but hey, it’s cold out! haha yessss. I love spicy soup! Thanks for the kind review, Jenn! This was lovely! No alterations. Husband said it was the best soup he’s ever had! And he’s not really a soup-guy. Yay! Thanks for sharing, Tracy! It was snowing in Southern California yesterday, you heard right…snowing! I take the train to work and was soooo cold when I got home. I thought…yes! The black bean soup and grilled “Daiya” cheese. Made it and loved it! Left the chipotle peppers out and added 3 more cloves of garlic. My hubbie and I slirpped it down and I finally got my core warm. Thank you Dana and John for this wonderful recipe. Ooh, love the addition of the vegan grilled cheese! Glad you liked it, Carol! Simple, well-balanced, and straightforward just plain good. If you’re reading comments, considering whether or not to make— look at all the variations people have commented they made and loved, and relax and just use what you have you can’t go wrong. Used a dribble of adobo sauce (opened a can, dumped it in a freezer bag, and swished the broth in the can before adding) in place of 2 peppers as my kids are on a “no spicy” kick (they who used to eat garden fresh japaleño so go figure). Also, I only had salted almond 80% chocolate, but the tiny niblets of almond were a subtly delicious addition. Garnished with fresh lime juice, cilantro leaves, and a dollop of coconut cream. Delicious easy dinner, it was great with some avocado on top. I added diced red bell pepper (I had one I wanted to use up) and it worked really well. Highly recommend this soup, can’t wait to have leftovers tommorow. My favorite black bean soup recipe yet! I made it as is, using 1 1/2 chipotle peppers and Trader Joe’s 85% dark chocolate. YUM. Amazing off the stove and super amazing after a day in the fridge. I added a dollop of plain Greek yogurt on top, some crunched up quinoa tortilla chips, and a lime squeeze (and a margarita). I’m gonna start my second batch tonight and maybe make some cornbread this time around! Love that it’s so cheap to make, so easy to reheat, and so accommodating to any leftover veggies in the fridge. haha yay! Thanks for sharing! Love this recipe so much! Tried it a second time and had a bunch of extra red cabbage on hand so added that, a can of rise roasted tomatoes, and a couple handfuls of chopped spinach. SO GOOD. I have never made a dish that so easy yet so full of flavour. I halved the recipe as I only had one can of black beans, I substituted the ‘chipotle peppers in adobo sauce’ for 1 tsp chipotle paste (from M&S) as I am in the UK and have never come across this. Instead of vegetable broth I used water and a stock cube. Anyway, it turned out beautifully, I had it with lots of lime, fresh guacamole and tortilla chips. Thanks for this. Do you put the chipotle peppers in whole or diced? I put them in whole and crush them with my mixing spoon but they can also be diced. Absolutely perfect recipe. The depth of this soup is unbelievable. A hit with the whole family. Thank you!! I LOVE most of your recipes, but this one was NOT for me. I’m not really sure what it was, but it was missing something. I felt like I was just being hit in the face with the chilies (I only added 3). Holy moly, three chilies? No doubt you felt hit in the face. The recipe calls for 1-2 and while I don’t consider myself a lightweight, I like warmth not a burn. I only added 1/2 of a chipotle and found that was plenty heat for me. This recipe is too good and easy not to try again, but I would definitely try it with fewer peppers (and less pain)! Part way through, taste it and if you need more heat it can always be added. This was my first time having black bean soup and it was amazing! This soup has a great texture and such complex flavours! Unfortunately I only had one can of black beans so I had to half the recipe – and promptly ate the whole thing. I also did not have coriander seeds so I had to leave those out and only had a very small amount of cumin, so I added all the cumin and some smoked paprika. I did include the abodo and cocoa powder though – one teaspoon each. But the number one most important ingredient that really transformed the dish was the lime juice! Once I added that too my bowl, it was simply amazing. Thanks for this delicious and healthy recipe! I do disagree with the serving suggestion though. I halved the recipe and it gave a single largw bowl but I don’t see how you would get four large bowls from two cans. I was going to comment the same thing about serving sizes! I halved the recipe for the same reason and was hoping to get two full lunches out of it, but instead I’m getting two side-soups (only because a whole can of beans in one sitting does not go well for me! It’s definitely delicious enough to eat an entire half batch in one sitting.) Looking at the recipe again, the bulk of the soup is the 2 cans of beans and 2 cups of broth, which is only about 6c worth of soup. Our bowls hold about 2c, which I usually find to be a hearty enough serving for most soups and chilis…I’d place the original here as being more like 3 large entree-sized servings, not 4. Thanks for sharing, ladies! If you’re looking for even heartier portions I’d recommend doubling the recipe as written (which you can do easily with the serving size scale in the recipe box). Woow. It looks really great. I want to do this. Thanks. Best black bean soup I have ever had! I added a little lemon juice for brightness. The addition of the chocolate/cocoa powder was subtle yet powerful. I haven’t typically been a fan of black bean soups but I had a feeling that this one would be different, and I was not disappointed! So easy, and very tasty, too. I’ll Immersion blend about half of it next time for a thicker mouthfeel (such a cringey word!) because I’d find it more satisfying as a meal. I paired this with a pepita-based taco salad recipe for work lunches this week and found the 4 bowls estimate was more like 3 for me. I also used cocoa powder instead of the chocolate and was impressed by the depth of flavor. Another commenter said “mysterious” and I agree. Will definitely make again. I made this recipe last night. It was great then but I feel like it’s even better today re-heated now that the flavors have had a few hours to get to know one another a little better. I have never had chili peppers in adobo sauce, so because my tongue is a wimp, I subbed this ingredient with about a teaspoon of ground dried cayenne pepper instead (I wasn’t surr if I could manage the other). This recipe will definitely be revisited. Also, my mom saw me put the chocolate in the pot and turned her nose up at the idea. My mother’s kitchen is not one for adventurous ingredients. I made her try a sip anyway once it was done. All she complained about was the amount of heat (this is where I get my wimpy taste buds from). Lovely! Thanks for sharing, Evelyn!! Everything about this is perfection! I had to stop myself for eating wayyy too much. Hearty, warming, and healthy. Loved the addition of chocolate- it really added something extra. Thank you for another great recipe! I made this yesterday with some tweaks, I added veg when sauteing the onion garlic (celery carrot and cubed potatoes) and tomato puree. It was soooo good. served up with rice and the kids ate it all too!! Yay! Thanks for sharing, Izzy! This is delicious…my new favorite way to make black beans! I followed the recipe completely. Maybe left it simmering a bit longer at the end because it’s VERY thick, more like black beans than black bean soup. I have it packed for lunch today, with some wilted baby spinach and brown rice…I can’t wait for lunch! I’ve made a lot of your recipes. I decided to make this last night. I had all the ingredients except for the chipotle. This was by far my least favorite recipe of yours. It tasted like pure CUMIN and I made the recipe as written. I hate to say it, but I threw it away. P.S. I still love MINIMALIST BAKER. 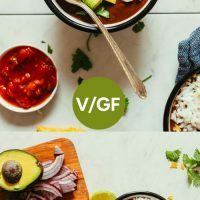 Best vegan blog on the web. I think you probably really needed the chipotles. No one spice or flavor stands out for me, it is a really nice blend that makes this recipe a stand out for me. So sorry to hear that! The chipotles do add quite a bit of flavor so maybe that was an issue. Otherwise perhaps your vegetable stock was a little on the low-sodium / not flavorful side? I’d say you probably just needed a little more salt, lime juice, and spice to round out the flavors. Holy smokes this was amazing. This will be on winter repeat. The chocolate was the perfect addition. Thank you again for another incredible recipe! Whoop! Thanks for sharing! Next time would you mind leaving a rating with your review? It’s super helpful for us and other readers! curious if the chocolate is necessary? i don’t like the taste of chocolate in savory food. Feel free to leave it out, Fae! I made this this weekend for my meal prep and I loved how it was such a simple yet wildly flavorful recipe. Even though I have been cooking for years, this was my first time using chocolate in a savory recipe and I LOVED it. It gave the soup such a depth of flavor and when paired with the smokiness of the chipotle peppers and cumin. It was perfection. Thank you! Yay! Thanks for sharing, Brittanie! Very tasty! Yes, letting the soup simmer to develop the flavors is the best tip. 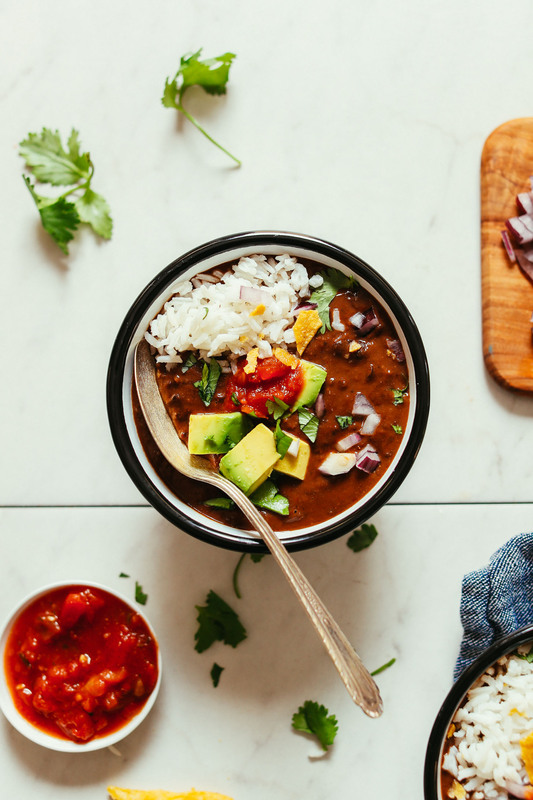 This is the first recipe for black bean soup that’s worthy! Thanks for the simple and yummy recipe. Delicious!! I just made this tonight–the only change I made was to add a can of diced tomatoes. Yummy and super easy to make, thank you for a terrific recipe! Doubled the amount of water, used 6 broth cubes, had no coriander so passed on that. Used a little more chill powder. For chocolate I broke up 3 chocolate cubes from a dark chocolate bar. The chilpotle peppers & abodo sauce took really gave this some depth. Will make again. Wife loved it. Whoop! Thanks for sharing your recipe changes, Ben! This was the SECOND time making your BBSoup! DeeeeeseeeeLISH!!! We’re so glad to hear that, Elle! 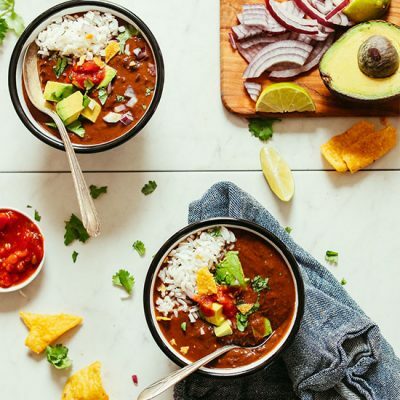 I love Panera’s Black Bean soup and I can’t wait to give your’s a try this weekend. Do you think you’ll invent something similar to Cava’s Tomato Harissa soup? That’s another one of my favorites, but I hate spending $4 for a cup of soup. I’ll add it to the recipe request list, Tamar! I finally made the soup and it was super scrumptious—even more delicious than Panera’s soup. Thank you for sharing this recipe with us. I was not firing on all cylinders at the grocery last night. I always have black beans and broth in my cupboard, so I picked up the chipotles and the chocolate and went on my merry way with no avocado, lime or cilantro (really?). I set out tonight and found that I did not have black beans and what I thought was broth was soy milk. I ended up with a tri-bean (kidney/black/pinto) soup made with water and with toasted corn tortilla strips, smoked sun-dried tomatoes and vegan sour cream for toppings. It was so good and easy and perfect for a chilly work night. The recipe has taken it’s spot on my fridge and I really look forward to making it the way it’s supposed to be made next time! I made this last night and enjoyed it! It’s been super cold here so soup was perfect for a new recipe to try! I left out the chipotle peppers because I don’t like spicy foods, but followed the other soup ingredients (using dark chocolate instead of cacao powder). This took me longer than 30 minutes to make, but that’s probably because *I am* the garlic mincer and decided not to use my mini chopper for the onions so I wouldn’t have to wash one more thing. I was a little disappointed with the flavors after it had been simmering for a while (and it was late and I wanted to eat instead of testing out adding spices, etc. ), but when I added some fresh lime juice and cilantro it really balanced everything out and made it pop! I’ll have to make some rice to go with it for my leftovers. Help! I am not sure what I did but I made this Way to hot and spicy. What can I ad to cut the heat? Some cashew cream perhaps? Otherwise, potatoes or rice should both absorb some of the spiciness! This is the best black bean soup I’ve ever made! I added a can of diced tomatoes, topped with avocado, cilantro and green onion. For the chocolate I added 3 tbs of dark chocolate chips. This totally hit the spot! This will be in our regular rotation! Yay! Thanks for sharing, Nicki! ok to leave out the coriander? I’m one of those anti-cilantro people! This looks like such a hearty and tasty soup! Black beans are one of my favorite legumes besides lentils and chickpeas, but I genuinely adore them all! Vegan dark chocolate is actually a fabulous way to add richness and pungency to the soup. I used it in chili before and it was such a glorious turnout! Reposting to add 5-star rating for depth of flavor and taste. I thoroughly enjoyed this recipe and am adding this to my list of favorites. Easy, quick, filling and OH MAN IS IT GOOD! I did puree my 2 chilies in Adobo, to hide them from my texture-sensitive Omni daughter. I cut the Chocolate/Cocoa WAY back – I used 2 tsp. of Cocoa powder and it’s rich and delicious. Next time, I’ll be adding a can of tomatoes and chilies as I have way too many in the pantry and think this is an amazing base to build chili off of. This is what I”m thinking before trying the recipe. I was scrolling through comments to see what people thought about the chocolate. I don’t think I can do it. maybe it’s because I’m not a huge fan of chocolate. I’m sure this recipe will be perfect without the chocolate. I’m excited to try it. Thank you for your comment. I usually love everything you post, but this just didn’t turn out at all. It had a completely overpowering bitter flavor. I couldn’t taste anything else. The only thing I can think is that if you sub with cocoa powder that it needs to be much less than 3 tbsp. Any other suggestions? I made it last night and used 2 tsp. of cocoa powder. It adds richness and very mild hints of flavour but it’s not bitter. I am not a huge cumin fan – sad but true. However, I am pleased to report that smoked paprika works JUST as well for the smokiness which, along with the chocolate, really makes this particularly special. It really hit the spot. Next time I am going to add celery and carrots, just to up the amount of veggies per serving. Thanks! We’re glad you enjoyed it, Maggie-beth! I take it back. I take it all back. The chocolate flavour was really strong after adding it, but once we got some tortilla chips, avocado, Cilantro and lots of fresh lime juice in there IT WAS INCREDIBLE. My 2 & 4 year olds declared it their favorite soup ever and licked the bowl. So good. I was loving the flavors until I added the chocolate. Have a feeling the kids are going to put up a fight tonight. May try again with much less cocoa powder next time. A bit too strong for us. Sorry to hear that, Kate! Feel free to scale back on the cocoa powder in future. Loved the layers of flavor in this dish. Yay! If you could rate the recipe next time, that would be a huge help to us! Thanks! I am LITERALLY stirring my black beans fro m scratch and add different things…but never thought to add cacao. It added a deepness that’s subtle and mysterious. Thanks so much. What perfect timing! Is there anything you can add to this to increase the veggie intake? I’d think carrots, peppers, and tomatoes would be a plus. Yes! I think you could add your favorite veggies to this soup, though it may make it more chili-like. Let us know if you experiment with the recipe! Do I need to substitute chipotle peppers in adobo sauce for something else, since I can’t have any spice at all? How much cacao powder if substituting? Right now in Wisconsin the temperature is -13 but feels like -30 so this soup is very timely!! I have a black bean soup recipe but this one is a significant notch above. Thanks! I will make this soon. You’re truly the best! I have been in love with Panera’s black bean soup for years and have tried various recipes online for copycats. I mashed some of the beans in the pot and the very end for a slightly thicker bean soup. Goes great with a crusty baguette :-) Thanks so much for another phenomenal recipe! Looks great! Would like to try this in my instant pot…any suggestions for how long to cook it there? The Instant Pot has a ‘bean/chili’ setting, so I’d assume that would be the correct one. Hmm not sure as we don’t have an Instant Pot. If you give it a go, let us know how it turns out as I’m sure others will be wondering as well! Hi there! I think about 6-10 mins in the instant pot with a 15 min NPR would be sufficient. I’ve made something similar with canned beans. You might also want to purée some of the soup at the end to mimic the thickness you would get from simmering the soup uncovered. In the IP no liquid is evaporated off so it will be a bit more watery. Or you could lessen the amount of vegetable broth as well. Hope that helps! Yum! I would’ve never thought to add dark chocolate but it kinda seems like the obvious. Just added chipotle peppers in adobo, coriander and dark chocolate to my shopping list. Hearty, straightforward, and the flavors stand out. A winner for winter. Chocolate is a nice addition. I paired this with white rice, lime, and cilantro. Yum! We’re so glad you enjoyed it! BTW, the black beans are awesome! I can only imagine that chocolate will make them even better! We hope you love this recipe, Liz! Let us know what you think!